Fact number one: I only learned to poach eggs the proper way last year. Fact number two: this is only the second time I have made hollandaise sauce. Fact number three: neither are anything to be afraid of. I made this as a Saturday morning late breakfast for myself and my sister, who had stayed over the previous night at her request as she adores eggs benedict and didn't know how to make hollandaise. Like me, she had previously thought it was a lot of hard work and very difficult, so having made it myself for friends a couple of months earlier I was keen to show her otherwise. The wonderful thing about making foaming hollandaise is, in using the egg white as well as the yolk, the sauce doesn't curdle. It is also much lighter. First, make the hollandaise: place the egg yolks in a blender (reserve the whites, you'll need them later) and season with salt and pepper. Then, in a saucepan, heat the lemon juice and white wine vinegar until it starts to steam. Turn on the blender and trickle the liquid in very slowly and steadily, and then turn off the blender. Now, turn your hand to the egg white - whisk in a large bowl until firm, as if making meringues (the egg white should form into peaks). Melt the butter in a saucepan, turn the blender back on and trickle the melted butter into the liquid, as you did with the lemon and vinegar. Then transfer the sauce to the egg white and fold it in. I keep it warm by fitting the bowl over a saucepan of simmering water. 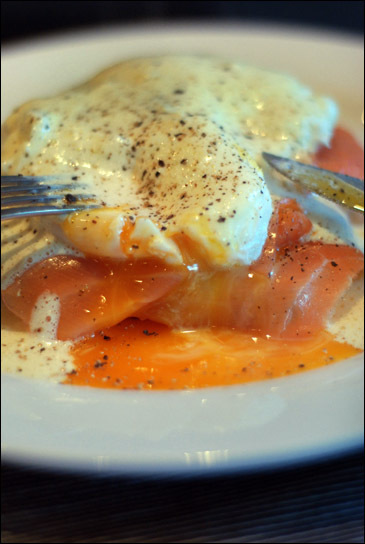 Now your hollandaise sauce is ready, assemble the rest of the ingredients: toast and butter your toast or muffins, place the smoked salmon on top (or fry your bacon and do the same if you're having eggs benedict) and then turn your thoughts to the poached eggs. For two eggs, I use about 3cm of water in the bottom of a pan and a teaspoon of vinegar. Use the freshest eggs you can get your hands on - these will keep their shape better. Stir the water to create a whirlpool, and then crack in your eggs one by one. This gets easier with practice! Simmer for a couple of minutes, until the whites are firm but the yolk still runny, and then place on top of your salmon or bacon. Pour over a tablespoon or so of hollandaise per person and tuck in. This looks scrumptious and your instructions are spot on. I stopped by to say hello and stayed longer than I planned. You have a lovely blog. I'll be back often.